To support The Pew Charitable Trusts' Public Safety Performance Project. Pew Charitable Trusts reviewed a draft of this page prior to publication. Note: We published an update on this grant in May 2017. We have agreed to a major partnership with The Pew Charitable Trusts and GiveWell as part of our work on criminal justice reform. Good Ventures will provide $3 million to support and expand the work of Pew’s Public Safety Performance Project (PSPP), which aims “to advance data-driven, fiscally sound policies and practices in the criminal and juvenile justice systems that protect public safety, hold offenders accountable, and control corrections costs” through technical assistance to states, research and public education, and promotion of nontraditional alliances and collaboration around smart criminal justice policies. Criminal justice reform is a current focus area for us, and PSPP appears to be one of the most prominent and effective organizations working toward change on this front. Funding and following its work represents an opportunity for both impact and learning. We are also interested in developing a relationship with Pew as a whole. We believe Pew will be a valuable resource as we continue to explore policy-oriented philanthropy. Based on conversations with Pew representatives, we see supporting PSPP as one of the best ways to support Pew as a whole. Finally, the process of establishing this partnership has itself been a valuable learning opportunity. With PSPP’s help, we have conducted a brief review of PSPP’s track record, which was our first attempt to assess the track record of a U.S.-policy-focused organization and taught us a fair amount about the criminal justice reform space. We have also dealt with new challenges around how to balance our goal of transparency with the goal of having maximal impact; when working on policy, there can be particular tension between these, and we have established an agreement regarding public discussion of PSPP that may serve as a guide to future grant agreements. What is PSPP’s role in the states where it provides technical assistance? Which states have gone through the justice reinvestment process? What types of policy changes have been made in justice reinvestment states? How do we evaluate the success of criminal justice reforms? 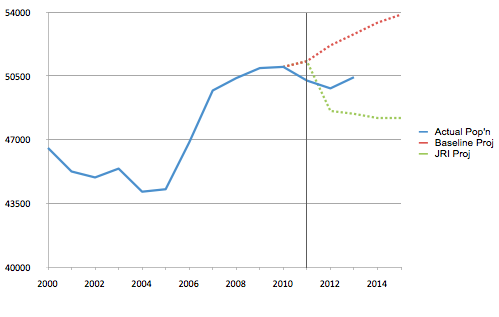 Were the bills PSPP worked on a big improvement over the status quo? How big of an impact does PSPP forecast for the bills it assisted? Vetting PSPP’s estimates of the impact of individual policy changes. What was PSPP’s role in the bills it assisted? Providing technical assistance to individual states. 10 We discuss this activity in more detail below. “PSPP supports efforts in select states that want a better public safety return on their corrections spending. The project also helps state officials, practitioners and others across the country share state-of-the-art knowledge and innovative ideas through national research and publications; policy evaluations; public opinion surveys; national, regional, multi-state, and state-level policy forums; and online information about what works to reduce recidivism. Much of Pew’s work in the states is conducted in a partnership with the U.S. Department of Justice’s Bureau of Justice Assistance (BJA) under what is called the Justice Reinvestment Initiative (JRI). Although the first three years of the justice reinvestment process (2007-2009) relied in part on BJA discretionary funding, the program was formalized with an appropriation from Congress in 2010. It is important to note that much of the public material about JRI (including a recent assessment of JRI by the Urban Institute) refers only to the work conducted under the formal federal program; this accounts for discrepancies in various documents about how many states have participated in the initiative and what the total projected savings are. Between 2007 and 2009, technical assistance to the states was provided by the Council of State Governments Justice Center (CSG) and the Vera Institute of Justice (Vera), with support from Pew and BJA. As a result of increasing demands for assistance from the states, Pew built the staff and organizational infrastructure to provide technical assistance to the states directly, beginning with South Carolina in 2009 for the 2010 legislative session. Between 2007 and 2013, twenty-seven states passed justice reinvestment bills and two states went through the process twice for a total of twenty-nine bills.28 PSPP either funded or itself provided technical assistance to each state other than Delaware, whose technical assistance was provided by the Vera Institute of Justice and funded entirely by the federal Bureau of Justice Assistance.29 The content of the bills varied; PSPP classifies twenty-three of the reforms as “comprehensive” and five as limited.30 In 2014, PSPP is providing assistance to two new states (Mississippi and Idaho) and one state in which a bill previously passed (Michigan).31 In order to receive justice reinvestment assistance, these states had to demonstrate their need for reform (as evidenced by large increases in corrections populations and costs) and that their leadership was committed to the reform process.32 A table listing the state, year, and characteristics of each justice reinvestment bill is available here. How meaningful were the bills that passed in the states where PSPP worked? How much of a role did PSPP play in the states where it worked? Would large, legislative reform packages have passed in PSPP’s absence? If so, to what extent did PSPP improve the quality of the bills? When evaluating reforms to the criminal justice system, we are primarily concerned with three outcomes. Our examination of PSPP’s track record focuses on the first of these factors – the organization’s impact on prison populations. This is the legislation’s most direct effect; if the bills PSPP assisted have a substantial impact, this is where we would expect it to show up most quickly. The bills’ effects on prison population are also the easiest to measure and the outcome for which we have the best data. Moreover, because decreases in prison population directly cause decreases in correctional spending, we would expect the bills’ effects on these outcomes to be very highly correlated. A portion of this decrease in correctional spending is reinvested in programs to increase public safety and the rest is used to improve state budgets. We have not closely looked into the amount of savings that are typically reinvested nor have we closely vetted the evidence behind these programs. A full review at the level of depth we investigate our top charities would have looked into these issues and would also have more closely looked into changes in crime rates, and in the composition of the prison population. As noted above, we would guess that there will not be a negative effect on either of these outcomes due to PSPP’s attention to improving community supervision and limiting prison beds for high level offenders. We have not carefully vetted these estimates. We plotted PSPP’s forecasts of post-reform prison population next to actual post-reform prison population in these states. 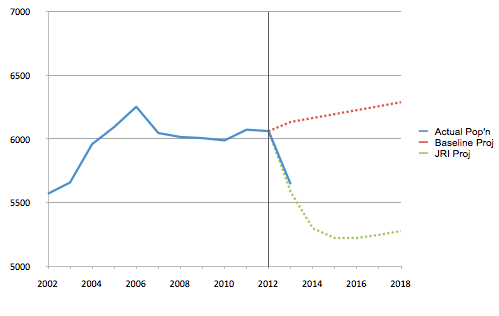 We looked to see whether actual post-reform prison populations were reasonably close to PSPP’s forecasts and to see whether there were noticeable breaks in prison population trends at the time various bills passed. We used data from the Bureau of Justice Statistics to graph actual prison population data in each state in which PSPP worked and examined these graphs to look for breaks in the trends at the time of reform. We calculated actual post-reform prison population changes in each state, including both states PSPP had worked in and states PSPP had not worked in. How reliable is the data related to that policy change? How “hard” is the policy lever used to create change (i.e. how likely are practitioners to implement the reform as intended)? Our bottom line is that there are clear limitations to the general model PSPP used to forecast the effects of Arkansas’ reform and we would expect to be more confident in PSPP’s more recent microsimulations (which address the above issues) than we are in this older model. Overall, we would guess that the Arkansas model’s limitations would lead PSPP to overestimate the speed with which the bill affected prison populations by up to a couple of years. However, assuming here for the sake of argument that the assumptions of the impact of individual provisions of the policy are correct, we would guess that the model’s limitations would not lead to a large overestimate of overall impact. PSPP estimated that Arkansas’ justice reinvestment bill saved 2,541 prison beds in the bill’s first year.68 Because PSPP projected that 74% of these saved beds resulted from three policy changes (see above), we focused on understanding how PSPP and Arkansas officials arrived at their projections of these three reforms. Reemphasizing the expectation that, absent behavioral violations or other circumstances, Arkansas maintains a presumptive parole system. Establishing a system allowing sentenced offenders held in jail to be transferred to parole even if they never entered a prison operated by the state Department of Corrections. PSPP estimated that this set of policies would cut both the percent of prisoners held beyond their presumptive parole date and the length for which those prisoners are held in half – to 25% and three months respectively – equivalent to a 78% reduction in the number of prison beds devoted to prisoners held past their parole dates.72 Overall, PSPP estimated that these policy changes would save 967 prison beds in 2011, which is 5.8% of the baseline forecasted prison population.73 PSPP told us that by six months after the bill was passed, the state had progressed halfway to PSPP’s predictions, with 47% of inmates held for an average of 4.2 months beyond their parole date.74 We do not have the expertise to determine whether PSPP’s assumption that Arkansas’ attempt to streamline the parole process will reduce the total amount of time prisoners are held past their parole hearing dates by 78%. The impact of the relevant policy changes is far from mechanical and could easily be reversed by a Governor unfriendly to reform. We would therefore guess that PSPP’s assumption is somewhat optimistic but based on the progress made after six months, it seems to be a good faith attempt and unlikely to be a major overestimate. Overall, we do not have the subject matter expertise to come to a confident conclusion about whether PSPP’s assumptions about the effects of each policy change in Arkansas’ legislative package are reasonable. However, while flaws in PSPP’s model may exist, PSPP’s approach to forecasting the effects of Arkansas’ reform strikes us as reasonable and it appears to us that PSPP had thought of and addressed most of the concerns we could come up with. We believe there is a high risk of relying too heavily on an organization’s own forecasts of its impact, but our vet of PSPP’s forecasting process left us reasonably impressed. 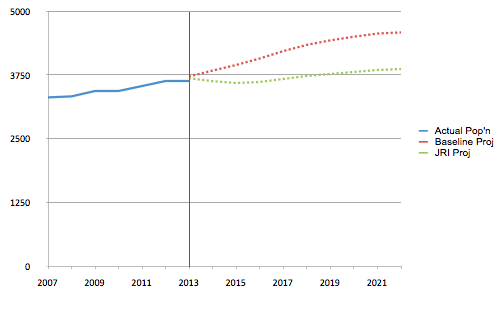 We thus would guess that PSPP’s forecasts are reasonable representations of the projected impacts of the reforms passed. Looking in depth at post-reform events in Arkansas Informal evidence suggests that SB 750 had a substantial initial impact on Arkansas’ prison population. 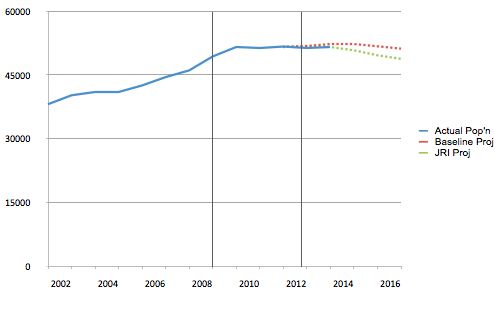 The bill was signed into law in March, 2011.85 Between 2011 and 2012, Arkansas’ prison population fell by 8.9%, which is a slightly greater decline than predicted by PSPP.86 However, this downtrend was reversed as the prison population rapidly increased by about 1,400 inmates in the three months from June to September 2013.87 While we have not investigated this issue in depth, journalistic accounts and conversations with PSPP both suggested that the increased prison population was caused by policy changes made by the Board of Corrections in response to a murder allegedly committed by a parolee who was arrested and charged with felonies repeatedly without having his parole revoked.88 These events somewhat reduce our confidence that gains achieved by PSPP will be sustained in the long run (although it is also possible that increased incarceration would have been even greater absent the reforms PSPP worked on). Some of the reforms PSPP assists rely heavily on buy-in from implementers and may face a heavy risk of reversal when a high profile crime occurs. Vertical lines represent year of reform. 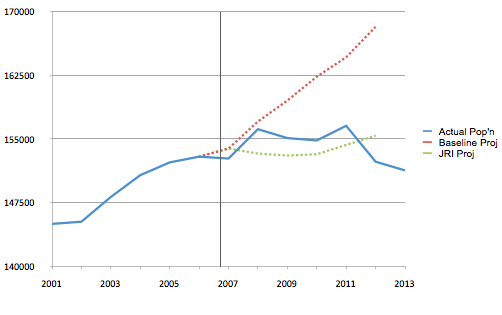 Graphs of pre- and post-reform prison population data could reveal breaks in trend that would be evidence of impact. Again, vertical lines represent year of reform. Taking a mean across all states with justice reinvestment bills, prison populations declined, on average, by 1.9% between December 31 of the year the bill passed and December 31, 2012. This result is difficult to interpret because it combines data from states less than a year out from reform with data from states reformed five years ago. Therefore, for each justice reinvestment state, we also report changes in prison population between December 31 of the year before reform, and December 31 of each following year. Taking a mean across states, we see that prison populations fell between 0.7% and 1.8% between the year before reform and 1-4 years afterwards.93 Overall, the average size of absolute declines in prison populations following the passage of justice reinvestment bills are consistent with the approximately 1.7% average absolute decline forecast by PSPP. Our beliefs about the overall impact of these bills therefore depend heavily on the counterfactual of what potential growth was actually averted and what would have happened in the bills’ absence. States that receive assistance from PSPP may differ from other states because they are required to demonstrate their commitment to the justice reinvestment process.96 We would guess that this cuts in the opposite direction from the previous factor and suggests that the states PSPP worked in were more likely to pursue reform in PSPP’s absence than the typical state. On the other hand, PSPP often develops relationships with state leaders, aiming to raise awareness of research and other state reforms, and build the political support necessary to adopt comprehensive reforms. Keeping the above caveats in mind, below we compare the aggregate prison population in states PSPP intensively assisted to the aggregate prison population among all other states. 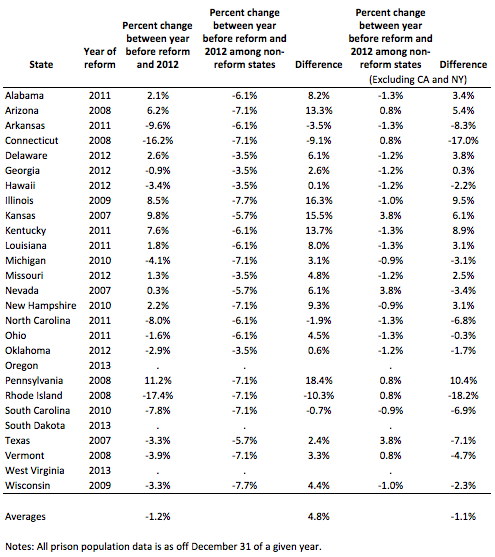 As an additional way to compare post-reform changes in prison population to changes in other states, for each state, we report below a) the percent change in prison population each state experienced between December 31 of the year before that state was reformed and December 31, 2012; b) the change in prison population among states that had not received assistance from PSPP by the end of 2012 over the same time period; and c) the difference between (a) and (b). We do this exercise including and also excluding New York and California from our measure of states unassisted by PSPP. Thus, we look at whether, after reform, states’ prison populations decreased relative to the rest of the country. On average, prison populations grow post-reform relative to states that did not receive assistance. When New York and California are excluded, prison populations decline by a mean of 1.1 percentage points relative to populations in the remaining states that did not receive assistance. What might explain the decline in prison population growth in states that did not receive PSPP’s assistance? As discussed above, idiosyncratic factors such as the Plata decision in California and NYPD policy in New York, systematic differences between states PSPP assisted and other states (i.e. selection effects), positive spillover effects from PSPP’s intensive assistance, and PSPP’s national research reports, conferences, partnerships, and other work all could have made contributions. Changes in non-justice reinvestment states might be attributable to executive, agency level, judicial, or prosecutorial policy changes. These changes may be more easily reversible than the legislative changes achieved by PSPP. Depending on how prison populations are counted, increasing jail populations may substitute for declining prison populations, so incarceration overall may not have decreased. PSPP’s technical assistance may have had positive spillover effects or PSPP’s research, public education, and support for nontraditional allies of reform may have led to population decreases in states where PSPP did not provide intensive assistance. A temporary response to the Great Recession. We would guess that this last possibility would not apply differentially to states that did not engage PSPP, so, were it to be true, it would probably not affect our overall conclusion. Comparing states that received intensive assistance from PSPP to states that did not lowered our confidence in the likely magnitude of the bills PSPP worked on. 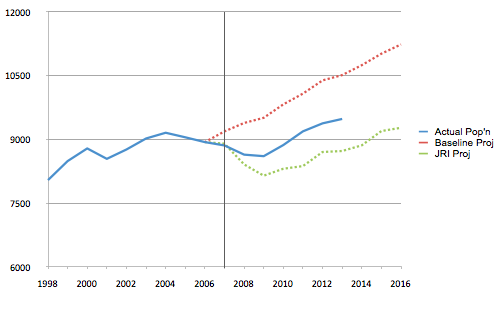 This comparison particularly called into question the idea that the “cost of doing nothing” would be as high as projected by PSPP and raised the possibility that potentially rising prison populations may have been averted by underlying dynamics (such as state fiscal problems, declining crime rates, increasing conservative support for reform, and policy diffusion among states) independent of PSPP. Overall, while this analysis raised questions, the data is compatible with the possibility that the bills PSPP worked on had a large impact on prison populations as well as the possibility that they averted little, if any, growth. If we pursue criminal justice reform in considerable depth, we plan to look into this issue further. This section cites the views of Representative Neal according to our conversation notes. This section cites the views of Mr. Tennille according to our conversation notes. While we are cautious not to place too much weight on the views of policymakers who worked closely with PSPP and were referred to us by the organization, we came away from these conversations believing that PSPP played a major role in these reforms.131 Both policymakers we spoke with strongly believed that their states would have struggled to pass high quality legislation without PSPP’s assistance. We do note, however, that the governor of each state was interested in reform prior to PSPP’s involvement. PSPP’s engagement may have been more important for improving the bills’ quality than for getting them on the agenda. Overall, the data are consistent with PSPP’s claim that by averting growth and causing slight declines in prison populations, the bills they worked on reduced prison populations (relative to the counterfactual) by an average of 11%. However, the data are also consistent with the possibility that prison growth would have leveled off even without these reforms and that the bills themselves saved a much smaller number of beds. After vetting PSPP’s overall forecasting process and many of the assumptions behind the forecasts in Arkansas, we were persuaded that PSPP makes a good faith and reasonable, if perhaps slightly optimistic, attempt to accurately forecast the effects of the policy changes made by these bills. Some of the important policy changes in Arkansas had fairly mechanical effects on the prison population. For example, much would have to go wrong for shortening the length of parole to fail to result in fewer revocations. Where the forecasts required more judgment, we felt that PSPP’s judgments were reasonable and had tried to incorporate most issues we, as non-experts, could think of. We also heavily weighed our interviews with two policymakers, both of whom strongly believed that an equally strong and data-driven bill could not have passed without PSPP’s assistance. Estimating the cost effectiveness of PSPP’s work in the states is challenging due to uncertainties in calculating both costs and benefits. We have explored PSPP’s track record (and discussed the difficulties of precisely estimating its impact) above. On the cost side of the equation, PSPP’s budget includes funding for national research, conferences and many other activities beyond direct assistance to states that likely contribute to the impact of PSPP’s state assistance. In addition, many of the JRI states received assistance from other providers, which receive funding from the federal government. 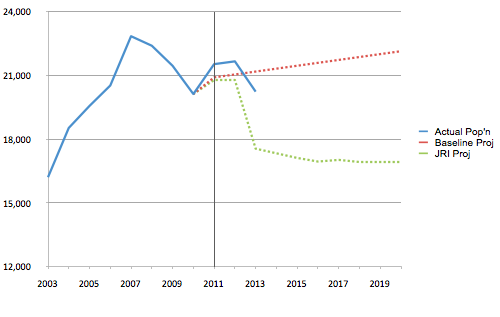 Below, we attempt an extremely rough calculation of the cost effectiveness of PSPP’s assistance to states as a back of the envelope check on whether funding PSPP would be reasonably cost effective if the bills PSPP assisted with had the effects PSPP claims. As above, our analysis attempts to focus on the benefits and costs of PSPP’s technical assistance to states and we do not attempt to quantify the cost effectiveness of its other work. We acknowledge that our ability to separately estimate the cost-effectiveness of PSPP’s state assistance is limited, because PSPP’s spending on other activities likely contributes to the success of this program. PSPP’s budget is not public but Pew and the Bureau of Justice Assistance together have spent no more than $25 million on state assistance across all states that have participated in the policy development phase of the justice reinvestment process going back to Texas and Kansas in 2006.132 To be conservative, we use this $25 million figure as though it were our estimate of combined Pew/federal spending on state assistance. If (as noted above) we assumed for the sake of the calculation that total spending to achieve these gains was $25 million, we would then calculate that Pew and BJA spent about $29 per “prison year averted,” again assuming none of the reforms would have happened without PSPP’s involvement. In addition, these averted prison years would have led to billions of dollars in savings to state budgets. We strongly emphasize the difficulty of quantifying the impact of policy work and advise our readers to treat these calculations as a back of the envelope check on whether PSPP’s cost effectiveness is in the same ballpark as other opportunities and not as a literal estimate of PSPP’s impact. 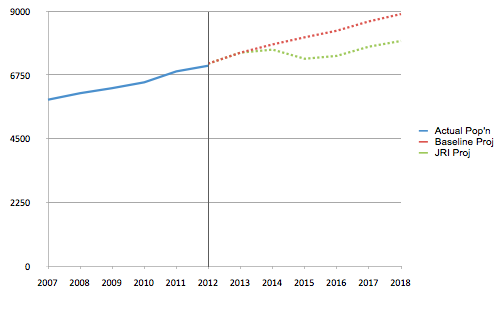 Based in part on these calculations, however, we do believe that PSPP’s past work is plausibly competitive with donations to our top charities, depending largely on how much of the impact of the reforms is (a) accurately estimated relative to the counterfactual and (b) attributable to PSPP. Providing intensive technical assistance to additional states seeking to improve their adult or juvenile justice systems. In 2014, these states include Mississippi, Idaho, and Michigan. Cementing gains in states that have undergone reform. PSPP will do this by helping states establish oversight councils to hold agencies accountable for implementation and by helping states construct performance measures to track progress. All new states will receive this assistance as well as certain states PSPP has already worked in. The oversight councils serve two key functions: 1) to receive the performance measurements and implementation updates from the agencies/entities most responsible for carrying out the new sentencing/corrections policies; vet that information; and hold the agencies accountable, and 2) to educate other public officials, the media and public regarding the progress on implementation and performance; suggest modifications to the policies; and advocate on behalf of resources needed to sustain improvements. The councils can be established formally through legislation or executive order, or less formally through Memoranda of Understanding (MOUs). PSPP intends to help states establish these councils and provide support in their initial meetings. Since many of these states are part of the Justice Reinvestment Initiative, PSPP will also facilitate the work of the “Phase II” (or implementation) assistance. Documenting the impact of reforms generated by PSPP. PSPP seeks to complete evaluations of at least four more policies the project has recommended in order to expand the evidentiary base for effective criminal justice policies. Producing additional research and publications. Studies planned over the coming years include a national report on the costs and consequences of allowing inmates to serve their full sentences and be released without community supervision and another report presenting multi-state juvenile recidivism rates and discussing best practices. Engaging and educating influential constituencies and nontraditional allies of reform. This includes supporting the expansion of Right on Crime and working with the National Sheriffs Association to highlight how the reform process includes sheriffs and local government representatives, and how local jails have benefitted from reform. Exploring potential reforms at the federal level. PSPP plans to explore whether there is an opening to make progress in the federal criminal justice system and also plans to advocate for an increase in appropriations to the Justice Reinvestment Initiative. We do not know which, if any, of these activities would be unlikely to happen without GiveWell’s support. We find it quite difficult to holistically asses an organization and the people that run it and we have limited observations to assess PSPP. PSPP’s Director, Adam Gelb, has communicated extremely well and directly with us, has had thoughtful answers to most of our questions, and has been quite open about sharing substantive information about PSPP. We first spoke with Mr. Gelb as part of our investigation of the cause of criminal justice reform and found that to be one of the most helpful conversations during that investigation. Both policymakers who worked on legislation with PSPP had extremely strong impressions of the organization, although we would (to some degree) expect referrals from PSPP to speak highly of them. PSPP is the organization we have seen whose approach to criminal justice issues – focusing prison beds on high level offenders, aiming to minimize the fiscal and humanitarian costs of the corrections system while maintaining or improving public safety, taking advantage of the unique opportunity to unite liberals and conservatives - matches the vision of the issues that we have identified as most promising. As we enter new fields in which we have little expertise, we believe it is valuable to collaborate with organizations that share our approach and seem strategic. PSPP’s self-evaluation is quite strong relative to that of other organizations we have seen, but leaves some questions unanswered, as discussed below. We hope to see PSPP’s self-evaluation improve over time and are eager to monitor the results of its development of new performance measures and its focus on the establishment of oversight councils in the states in which it works. Would a bill have been introduced without PSPP’s assistance? If so, would that bill have passed without PSPP’s assistance? If a reform bill would have passed without PSPP’s assistance, would the bill have been of lower quality? 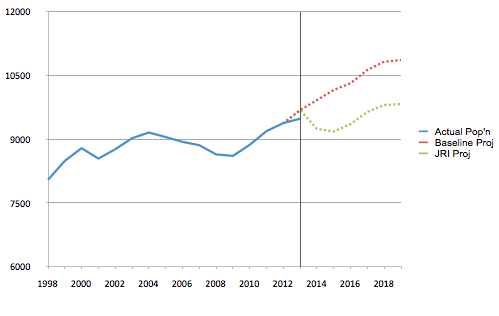 If a similar bill would not have passed without PSPP’s help, would some other policy change or non-policy change (such as a decrease in crime) have led to a decline in prison growth? 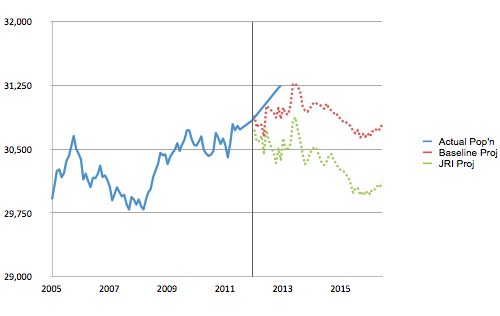 The risk that policy gains achieved by PSPP won’t be sustained. In one state, Arkansas, we did see evidence that policy gains from a bill that PSPP worked on were reversed after a parolee whose parole was not revoked despite multiple felony arrests allegedly killed a man in Little Rock (more in the section on Arkansas above). PSPP has told us that over the next two years they plan to significantly expand their efforts to promote the sustainability of policy reforms (see above). It is possible that this is an inherent risk of PSPP’s model, which focuses on working directly with policymakers to achieve reforms in the near-term, but we accept this risk and believe it is outweighed by the model’s apparent effectiveness in achieving policy wins. The risk of unintentionally increasing the crime rate. We have not seen evidence of an adverse impact on the crime rate and would guess that PSPP’s work would not increase crime because of PSPP’s emphasis on improving community corrections, which may reduce recidivism, and because PSPP promotes policies that focus prison beds on high level offenders.137 However, we have not investigated this issue in-depth. 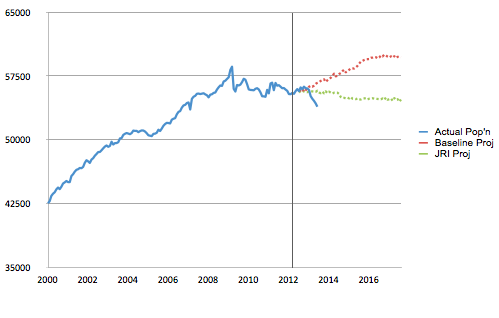 The marginal effect of additional funds to PSPP. PSPP’s capacity for monitoring and self-evaluation is still improving.138 We would have more confidence in PSPP’s track record if such measures already existed and could be examined. PSPP only tracks the accuracy of some of the intermediate-level predictions that are inputs into the forecasts it uses as evidence of impact and, as far as we know, does not always evaluate the accuracy of these forecasts.139 However, PSPP’s self-evaluation strikes us as reasonable given the large number of policy changes they have been involved with in a relatively short period of time. Also, PSPP’s plans going forward include helping states establish more rigorous measurement of outcomes, including population, costs, and recidivism. We have not looked into whether PSPP’s reforms and the Project’s broader efforts to address and reshape the crime/incarceration debate (through national research and polling, partnership with other organizations, promoting nontraditional voices for reform, and other means) have had an impact on states where PSPP did not provide intensive technical assistance. Much of this work strikes us as impactful, but we find it difficult to rigorously evaluate. GiveWell publishes commentary and updates evaluating Pew’s progress, all of which is shared with Pew in advance of posting. Substantive updates are limited to one in each of two grant periods, and one update after the end of the final grant period. If GiveWell or Good Ventures wishes to publish comments about a federal or state policy initiative where Pew is actively working toward legislation that has not passed or regulatory changes that are not finalized, they will only publish content that has been approved in advance by Pew. GiveWell and Good Ventures agree to respect the confidentiality of private information shared by Pew. GiveWell and Good Ventures provide updates to Pew on all forthcoming publications, commentary, and pending grants related to criminal justice and drug policy. Before the finalization of any pending grant whose purpose is to fund work (specifically advocacy work, a state policy initiative, or a ballot initiative) where Pew is actively working toward legislation that has not passed or regulatory changes that are not finalized, Pew will have an opportunity to provide comments to GiveWell and Good Ventures. The parties communicate regularly via phone, email, and, when possible, in person to discuss progress. The Agreement can be terminated prior to its expiration, unilaterally by any of the parties to it, in which case any uncommitted grant funds will be returned, and GiveWell and Good Ventures will refrain from further public commentary on the project. This agreement was in place at the time of this page’s publication and - in accordance with our usual procedures - PSPP was able to review and privately comment on an outline of the page and on the page itself before it was published. 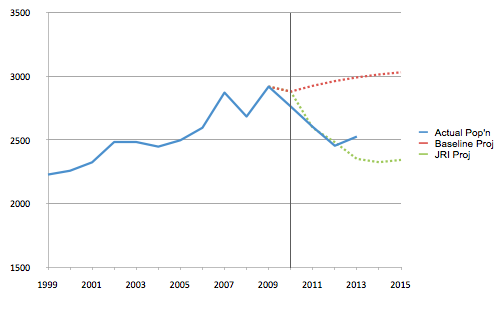 Trends in lengths of stay in prison: Time Served: The High Cost, Low Return of Longer Prison Terms). PSPP’s support for the Prison Fellowship is mentioned on the PSPP website. PSPP also provides technical assistance to states reforming their juvenile justice systems. We did not investigate this activity. “The guiding principle of JRI is data-driven, consensus-based, bipartisan, and interbranch decisionmaking.” LaVigne et al 2014, pgs. 10-11. “A state begins by convening an interbranch and bipartisan working group of policymakers and justice system leaders. This working group develops a shared vision of justice reform, guides data analysis, encourages information sharing, and engages in policy option development. It is imperative that the working group is interbranch and bipartisan, enabling it to take a system level approach to criminal justice reform that will be politically feasible. Working groups are formed through a variety of mechanisms—such as statute or appointment— or an established criminal justice committee or commission can be repurposed. In Pennsylvania, the Pennsylvania Commission on Crime and Delinquency convened the working group;25 in Louisiana, the Louisiana Sentencing Commission, established by statute, served as the state’s JRI working group.26” LaVigne et al 2014, pg. 13. We chose these states, Georgia and Arkansas, fairly arbitrarily from a list of five states (Arkansas, Georgia, Hawaii, South Carolina, and South Dakota) for which PSPP had provided us with impact forecasts. Jennifer Laudano, PSPP communications director, email to GiveWell on November 14, 2013. We discuss below our cautious interpretation of our interviews with these policymakers given that they were referred to us by PSPP. The “limited” reforms occurred in Arizona (2008), Illinois (2009), Louisiana (2011), Alabama (2011), and Missouri (2012). PSPP presentation to Good Ventures and GiveWell. PSPP does not include Delaware in either of these groups. “While states have many compelling incentives for joining JRI, it is critical that their readiness to engage in the process is thoroughly assessed. The assessment process begins when a state expresses interest in participating in JRI, at which point one of the TA providers conducts a preliminary assessment before recommending that the state be selected as a JRI site. The TA provider holds orientation calls and makes site visits, speaking with key policymakers such as the governor’s office, attorneys general, corrections leadership, legislative leaders, and members of the judiciary to familiarize them with JRI and assess state leadership interest in participating. The TA provider then determines whether the goals of state leadership are aligned with those of JRI, evaluating the suitability of potential JRI sites on six criteria: (1) commitment of state leadership to JRI, as evidenced by a letter of interest signed by key state leaders that includes a well-articulated and compelling problem statement addressing the state’s need for justice reform; (2) commitment to information sharing and demonstration of sufficient data capacity to support analysis, including information on criminal justice populations and outcomes, such as arrests, average daily prison population, admissions and length of stay, and revocation rates; (3) participation of an influential leader or leaders to drive systems change and interagency collaboration; (4) existence of information, data, and personnel infrastructure to support the comprehensive data analysis and execution of JRI; (5) a systemwide partnership in the form of an interbranch and bipartisan working group, or plans to develop such an entity; and (6) knowledge about and use of EBPs demonstrated through previous EBP implementation activities.23 In addition, states are assessed for their overall need for JRI, with a particular focus on those states that have had large increases in corrections populations and costs. On the basis of these selection criteria, the TA provider prepares a recommendation for BJA and Pew outlining the state’s strengths as a JRI site and potential barriers to JRI implementation.” LaVigne et al 2014, pg. 11. “JRI states used various strategies to address their cost and population drivers; many of the strategies exemplified the themes of evidence-based practices (EBPs) and data-driven decisionmaking. The following are some of the most common JRI legislative provisions and policy reforms. Risk and needs assessments, implemented in 16 JRI states, help predict a person’s risk to reoffend through the identification of criminal risk factors. These assessments inform decisions about detention, incarceration, and release conditions as well as the allocation of supervision and treatment resources. Accountability measures, such as mandatory reporting and certification, were adopted by 15 JRI states. These include ensuring the use of EBPs, requiring that departures from sentencing guidelines be justified, and developing new data reporting requirements to facilitate the evaluation of justice system operations. Earned credits include both good time and earned time credits. These credits provide sentence reductions for inmates who maintain good behavior or participate in prison programs. Earned credits were adopted by 15 JRI states. Intermediate and graduated sanctions establish swift and certain responses, such as short jail stays, for parole and probation technical violators. These sanctions are alternatives to reincarceration. The HOPE (Hawaii Opportunity Probation with Enforcement) model for probationers, which couples swift and certain punishment with drug testing, is being piloted in three JRI states. Some states have developed response matrices that include both punitive and incentive-based responses designed to promote offender accountability and positive behavior change. Fifteen JRI states adopted intermediate and graduated sanctions. Community-based treatment programs were developed or expanded in 11 JRI states. States expanded the availability of programming and services by increasing funding for key services such as substance abuse treatment, and many encourage the use of these programs by requiring that reentry plans be developed for exiting prisoners. Sentencing changes and departure mechanisms reorient and reclassify/redefine offenses, revise mandatory minimums, provide safety valves and departure mechanisms, and expand nonincarceration options. A variety of these changes were adopted among the 11 states that made sentencing changes. Mandatory supervision requirements ensure that certain exiting prisoners receive post-release supervision. States may use risk assessments to target serious offenders or those at high risk of reoffending for supervision. This type of policy change was adopted by seven states. Problem-solving courts use an evidence-based approach to provide treatment for offenders with specific needs. To better address the needs of these populations, states either expanded existing problem-solving courts or created new ones. Often, problem-solving courts in JRI states focus on those with substance abuse and mental health disorders. Six JRI states created or expanded problem-solving courts. Streamlined parole processes and expanded parole eligibility facilitate the release of eligible offenders to parole supervision, shortening lengths of stay while ensuring that appropriate supervision conditions are met to protect public safety. Six states streamlined the parole processes, and five expanded eligibility for parole.” LaVigne et al 2014, pgs. 2-3. We chose Arkansas, fairly arbitrarily from a list of five states (Arkansas, Georgia, Hawaii, South Carolina, and South Dakota) for which PSPP had provided us with impact forecasts. Jennifer Laudano, PSPP communications director, email to GiveWell on November 14, 2013. We considered the fact that Arkansas was a medium-sized Southern state in which PSPP claimed a substantial victory. PSPP forecast that Arkansas’ reform bill would save 3,202 prison beds in 2020. 457 of these beds (14%) were saved by implementing earned discharge from parole, 777 (24%) were saved by encouraging adherence to sentencing guidelines and 1,136 (35%) were saved by implementing parole release guidelines. PSPP. AR impact calculations. Thus a total of (457+777+1,136)/3,202 = 74% of the beds saved were due to these three policies. “When offenders are sent to prison they are given a transfer eligibility date (TED) indicating when, absent a disciplinary record or failure to satisfy special conditions, they will be transferred to parole supervision.17 The working group’s analysis indicated that more than half of inmates are held, on average, six months beyond their presumptive TED. No reason is recorded for most of these delays, which accounted for nearly 1,200 prison beds in 2009.18” PSPP. Arkansas’s 2011 Public Safety Reform, pg. 5. “Improve Parole Release Process: Develop and implement parole release guidelines with a presumption of release for offenders without a disciplinary record. Begin transfer proceedings earlier (6 months prior to release) and streamline case review of offenders housed in county jails with roving intake teams. Implement mandatory training requirements and appointment qualifications for the Parole board and require it to produce monthly performance reports.” PSPP. Arkansas’s 2011 Public Safety Reform, pg. 9. “Focus on High-Risk Offenders by Permitting Earned Discharge from Probation and Parole. Grant DCC authority to discharge offenders at ½ of their community supervision term if they have complied with court-ordered conditions. Require DCC to convene a group of judges, prosecutors, public defenders and law enforcement officials to determine criteria for discharge and provide notification to the prosecuting attorney or parole board before discharge.” PSPP. Arkansas’s 2011 Public Safety Reform, pgs. 8. “Strengthen Reporting Requirements and Encourage Compliance with the Sentencing Guidelines. Merge the sentencing guideline worksheet and departure form with the sentencing and commitment form and require signature from the sentencing judge and prosecuting attorney. Enhance research capacity at the Sentencing Commission and require it to produce annual reports on guideline compliance (including county-level data).” PSPP. Arkansas’s 2011 Public Safety Reform, pgs. 8-9. “Early vs. later states: Evaluating the impact of JRI reforms on prison populations necessarily requires emphasis on states that adopted reforms further in the past. It is too soon to gauge results in the most recent states such as Kansas, South Dakota, Oregon, and West Virginia since those reforms have been in effect for less than a year. It is important to note, however, that the JRI process has evolved substantially since it was first introduced in 2007. The more recent states have received a more robust package of technical assistance and, in part because of that, have enacted more comprehensive reforms which, if well implemented, would produce larger population impacts than were achieved in the earlier states.” PSPP. Memo regarding comparing prison population trends across states, pgs. 3-4. “Risk and needs assessments, implemented in 16 JRI states, help predict a person’s risk to reoffend through the identification of criminal risk factors. These assessments inform decisions about detention, incarceration, and release conditions as well as the allocation of supervision and treatment resources… . Community-based treatment programs were developed or expanded in 11 JRI states. States expanded the availability of programming and services by increasing funding for key services such as substance abuse treatment, and many encourage the use of these programs by requiring that reentry plans be developed for exiting prisoners… . Mandatory supervision requirements ensure that certain exiting prisoners receive post-release supervision. States may use risk assessments to target serious offenders or those at high risk of reoffending for supervision. This type of policy change was adopted by seven states.” LaVigne et al 2014, pg. 2. “Total state spending on corrections— including bonds and federal contributions—topped $49 billion last year, up from $12 billion in 1987.” Pew. One in 100: Americans Behind Bars in 2008, p. 11. We have not vetted this data. “While there is wide variance among states, in 2008 prisons cost our 33 surveyed states an average of about $79 per inmate per day—or almost $29,000 per year.” 1 in 31: The Long Reach of American Corrections, p. 12. 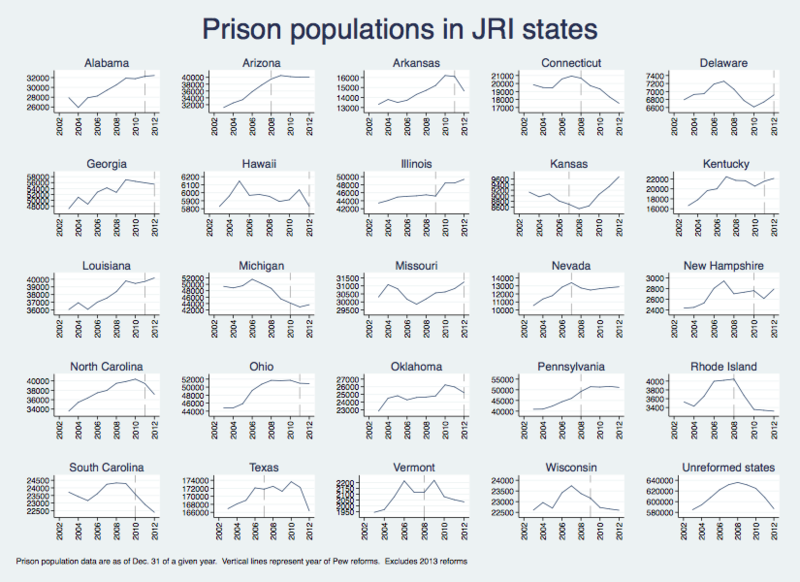 “In addition, states are assessed for their overall need for JRI, with a particular focus on those states that have had large increases in corrections populations and costs. On the basis of these selection criteria, the TA provider prepares a recommendation for BJA and Pew outlining the state’s strengths as a JRI site and potential barriers to JRI implementation.” LaVigne et al 2014, pg. 11. 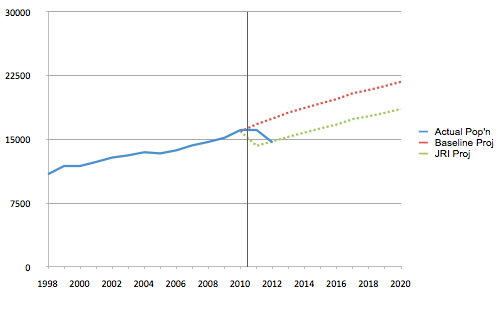 In earlier years, these forecasts were created by PSPP’s contractors. More recently, PSPP’s staff has created these forecasts internally. PSPP conversation on December 19, 2013. For simplicity, we refer to the forecasts as PSPP’s throughout. Additionally, for Arizona’s 2008 bill, PSPP shared its baseline forecast of what would have occurred in the absence of reform but no post-reform projection was made in that state. The Vera Institute of Justice provided the technical assistance to Alabama, Delaware, Illinois, and Louisiana’s reforms and did not create projections for those reforms. Adam Gelb, PSPP Director, comments on GiveWell outline We did not request projections from South Carolina (because we had already observed graphs of those projections, which are published in LaVigne et al 2014, pg. 115). We do not know why PSPP did not provide projections from Arizona, Connecticut, Michigan, Oklahoma, Pennsylvania’s 2008 reform, or Wisconsin. Calculated from PSPP. Prison populations and forecasts spreadsheet. “The new law is projected to save Arkansas $875 million in averted prison construction and operation costs through 2020.” PSPP. Arkansas’s 2011 Public Safety Reform, pg. 1. “HB 1176 is projected to avert all the anticipated growth in prison population and costs over the next five years, saving at least $264 million. ” PSPP. 2012 Georgia Public Safety Reform, pg. 1. “The changes will allow Hawaii to bring back inmates housed in mainland prisons and save the state an estimated $130 million over five years.” PSPP. Leading on Public Safety: 4 Governors Share Lessons Learned from Sentencing and Corrections Reform, pg. 6. “The state estimates the reforms will save $422 million over 10 years, allowing increased investment in programs to reduce recidivism with residual funds available for state budget relief.” PSPP. 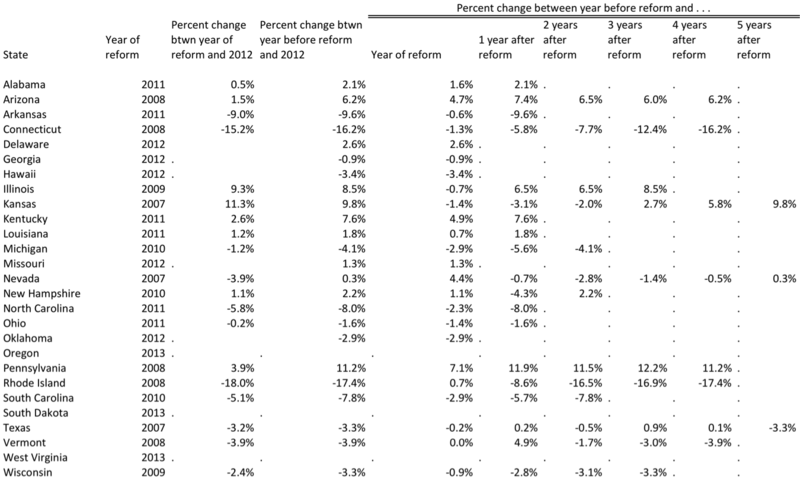 2011 Kentucky Reforms Cut Recidivism, Costs, pg. 1. We chose Arkansas from a list of five states for which PSPP sent us impact projections. Arkansas was chosen fairly arbitrarily, although we did consider that it was a mid-sized, Southern state for which PSPP claimed fairly high impact. Adam Gelb, PSPP Director, comments on GiveWell outline. For simplicity, we continue to refer to the forecasts as PSPP’s forecasts. We focused on vetting Pew’s estimates of the percent deviation from “the cost of doing nothing” caused by each policy change and therefore did not additionally vet the absolute value of the “cost of doing nothing” forecasts themselves. Data on Arkansas’ prison population provided in PSPP. Prison populations and forecasts spreadsheet. (16,147-14,686)/14,686 = 9.9%. PSPP. Prison populations and forecasts spreadsheet. 19,222-16,279 = 2,943. 2,943/19,222 = 15.3%. Jake Horowitz and Brian Elderbroom conversation on January 10, 2014. PSPP does not believe this will be a large effect because many prisoners do not serve more than a year in prison (hence the bed is saved in the same year in which they are admitted). Jake Horowitz and Brian Elderbroom conversation on January 10, 2014. In general, we did not feel PSPP explained why the model was designed in this way but we did not push hard for an answer and believe it was reasonable that they did not know this detail three years after the model was constructed by one of PSPP’s contractors. PSPP forecasted that, in the bill’s absence, Arkansas’ prison population would have been 16,767 in 2011. Instead, due to reform, they forecast a prison population of 14,226. PSPP. Prison populations and forecasts spreadsheet. 16,767-14,226 = 2,541 saved prison beds. ” When offenders are sent to prison they are given a transfer eligibility date (TED) indicating when, absent a disciplinary record or failure to satisfy special conditions, they will be transferred to parole supervision.17 The working group’s analysis indicated that more than half of inmates are held, on average, six months beyond their presumptive TED. No reason is recorded for most of these delays, which accounted for nearly 1,200 prison beds in 2009.” PSPP. Arkansas’s 2011 Public Safety Reform, pg 5. We rely here on data provided by PSPP and did not carefully vet their process for collecting this data. “No reason is recorded for most of these delays, which accounted for nearly 1,200 prison beds in 2009.” PSPP. Arkansas’s 2011 Public Safety Reform , pg. 5. PSPP told us that estimating the impact of these policies was as much of an art as a science and told us that they relied strongly on advice from criminal justice practitioners on the ground in forming their estimates. “One section of Arkansas’s 2011 reform package sought to streamline the process of transfer to parole supervision by establishing presumptive parole absent disciplinary infractions, requiring parole board training, and ensuring transparency in parole board decisions. Results: Prior to reform, 55 percent of inmates were held beyond their transfer eligibility date for an average of 6.2 months each, accounting for nearly 1,200 prison beds. Six months after reform, the percent of inmates held beyond their eligibility date had fallen to 47 percent for an average of 4.2 months each.” Adam Gelb, PSPP Director, email to GiveWell on January 17, 2014. “Focus on High-Risk Offenders by Permitting Earned Discharge from Probation and Parole: Grant DCC authority to discharge offenders at ½ of their community supervision term if they have complied with court-ordered conditions. Require DCC to convene a group of judges, prosecutors, public defenders and law enforcement officials to determine criteria for discharge and provide notification to the prosecuting attorney or parole board before discharge.” PSPP. Arkansas’s 2011 Public Safety Reform, pg. 8. “In 2009 there were 2,236 admissions to prison for parole violations with a new charge and 29% of them violated in the latter 50% portion. These offenders would have their total LOS reduced by 10.3 months.” PSPP. AR Impact Assumptions Note that this data was provided to us by PSPP and we did not carefully vet the way the data was collected. PSPP’s model appears to have a slight typo leading to a small underestimate of the number of beds saved due to this policy. Their description of their assumptions says that 29% of admissions for parole violations with a new charge occurred in the second half of the parolees’ parole term, but the model itself multiplies by .20 instead of .29. We do not know whether the typo was in PSPP’s description of the assumptions behind its model or in the model itself. As a benchmark, PSPP also estimated the effect of complete adherence to sentencing guidelines. “Complete adherence to sentencing guidelines consists of 2 impacts. Complete diversion from prison if an offender was sent to prison but fell within a cell where prison was not an option. The second impact was created by comparing the total net sentence an offender received with the recommended range for the appropriate cell. In the event an offender was sentenced over the presumptive range, the offender was assigned the maximum end of the presumptive range. In the event an offender was sentenced under the presumptive range, the offender was assigned the minimum of the presumptive range. The combination of these 2 calculations results in the total impact.” PSPP. AR Impact Assumptions. Complete adherence to guidelines would save 4,004 prison beds in 2011. PSPP. AR impact calculations. 674 beds saved/4,004 beds saved by complete adherence = 16.8%. “The Public Safety Improvement Act passed both chambers of the General Assembly with overwhelming bipartisan majorities and was signed into law by Governor Beebe in March 2011.” PSPP. Arkansas’s 2011 Public Safety Reform, pg. 1. (16,037 – 14,615)/16,037 = 8.9% decrease. “Wendy Ware of Denver-based JFA Associates [PSPP’s contractor] told lawmakers the firm needed another six months — until March — to assess an increase of about 1,400 prison inmates since June.” “Inmate spike delays report”, Arkansas News. The projection of post-reform prison populations in Nevada was also a substantial overestimate, but because the actual data in no way resembles the projection that prison populations would continue increasing after reform, we would guess this was because of external factors and not because Nevada’s reforms were substantially more effective than predicted. These graphs only include actual data (not forecasts). 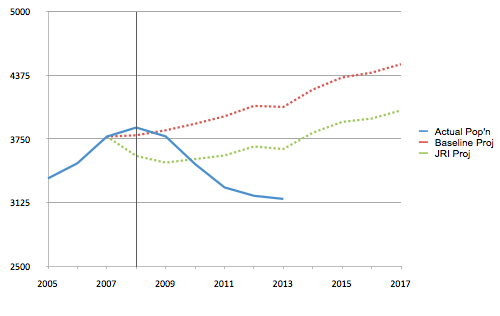 These graphs include states where PSPP worked but for which PSPP did not provide data. 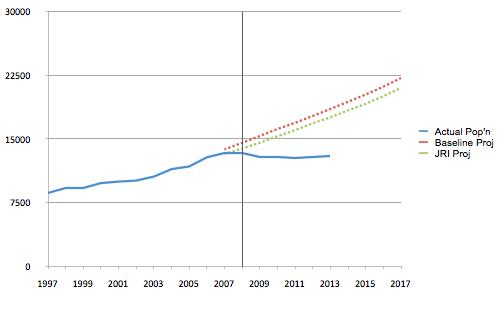 These graphs cover a slightly different time span than those provided by PSPP (2002 to 2012) for each state. These graphs use a different data source – the U.S. Bureau of Justice Statistics’ Corrections Statistics Analysis Tool – while PSPP collected data from the states themselves. See the next bullet for more detail on this data. The data from these graphs and throughout this analysis comes from the Bureau of Justice Statistics’ Corrections Statistics Analysis Tool and is the total number of prisoners within each state’s jurisdiction. The data for certain states includes inmates held in nonsecure privately operated community corrections facilities and juveniles held in contract facilities, jail populations, prisoners in the custody of the state instead of prisoners under that state’s jurisdiction, or dual jurisdiction cases. We would guess that these minor differences in the ways that states report data to the Bureau of Justice Statistics would not account for major differences in the prison population trends in these states. We have uploaded a spreadsheet with detailed notes on the data here. We used Sentencing and corrections reforms in justice reinvestment states to determine which states underwent reform and in which year. The graph of “unreformed” states includes Florida and New York. See below for a discussion of potentially idiosyncratic changes that contributed to decreases in incarceration in those states. If Florida and New York were excluded, the decline in prison population would be less pronounced, but the pattern of population growth subsiding in 2007-2008 would remain. The prison population indices for each state were created by calculating the percent change between the prison population in that year and the prison population on December 31 of the year before reform and then adding 100. This creates an index set to 100 on Dec. 31 of the year before reform. Despite a compelling case when this graph is viewed in isolation, we do not include Arkansas because, as discussed above, prison populations returned to their prior levels in 2013. We do not emphasize the average change between the year before reform and five years after reform because only three states have such data. “JRI selects states for project participation based, in part, on the potential for individual states to achieve meaningful reforms that will protect public safety, hold offenders accountable, and control corrections costs. One of the major motivating factors for state leaders to consider reform has been the significant cost of projected prison growth in their states. So high projected growth is one of the factors considered in selecting JRI states. This introduces substantial “bias” into comparisons of JRI and non-JRI states. Even if there were similarities among groups of states on many of the crucial system and political dimensions, this selection bias means that JRI states in general were facing steeper growth curves than other states. 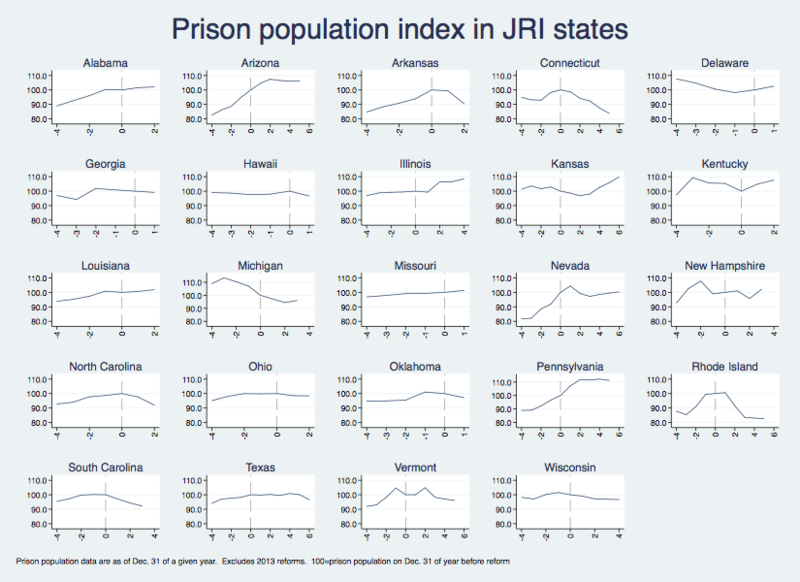 That JRI states tend to have fast-growing prison populations is illustrated by the GiveWell analysis: some of the states with the highest post-2008 growth indices (South Dakota, West Virginia, and Idaho) have since become JRI states.” PSPP. Memo regarding comparing prison population trends across states, pg. 1. See charts of prison population indices for states that underwent comprehensive reform and states that did not participate in justice reinvestment below. “While states have many compelling incentives for joining JRI, it is critical that their readiness to engage in the process is thoroughly assessed. The assessment process begins when a state expresses interest in participating in JRI, at which point one of the TA providers conducts a preliminary assessment before recommending that the state be selected as a JRI site. The TA provider holds orientation calls and makes site visits, speaking with key policymakers such as the governor’s office, attorneys general, corrections leadership, legislative leaders, and members of the judiciary to familiarize them with JRI and assess state leadership interest in participating. The TA provider then determines whether the goals of state leadership are aligned with those of JRI, evaluating the suitability of potential JRI sites on six criteria: (1) commitment of state leadership to JRI, as evidenced by a letter of interest signed by key state leaders that includes a well-articulated and compelling problem statement addressing the state’s need for justice reform; (2) commitment to information sharing and demonstration of sufficient data capacity to support analysis, including information on criminal justice populations and outcomes, such as arrests, average daily prison population, admissions and length of stay, and revocation rates; (3) participation of an influential leader or leaders to drive systems change and interagency collaboration; (4) existence of information, data, and personnel infrastructure to support the comprehensive data analysis and execution of JRI; (5) a systemwide partnership in the form of an interbranch and bipartisan working group, or plans to develop such an entity; and (6) knowledge about and use of EBPs demonstrated through previous EBP implementation activities.23” LaVigne et al 2014, pg. 11. “There may be some national trends in policy making by governors and legislators, and in case-level decision making by individual judges, prosecutors, parole board members, probation officers and other system actors, that are influenced by an overall climate of reform and general attitudes toward crime and punishment. While Pew, JRI partners and others working in the field cannot claim anything near exclusive credit for creating an environment for reform, changing the national conversation from “tough vs. soft on crime” to “public safety return on investment” is a key goal of our broader work. This work has included hundreds of research publications, extensive media outreach, and scores of convenings with leading policy makers across the country. These national efforts “contaminate” the group of non-JRI states by exposing policy makers in those states to justice reinvestment data and strategies. Comparing them to the intensive assistance states effectively counts these broader national efforts against the impact of work in intensive JRI states. This is unfortunate since any policy change effort should seek to maximize change with available resources.” PSPP. Memo regarding comparing prison population trends across states, pg. 2. PSPP. Memo regarding comparing prison population trends across states, pg. 2. “Beyond these broad national impacts, Pew and its partners have provided limited assistance in some states, including California, Florida and Colorado. 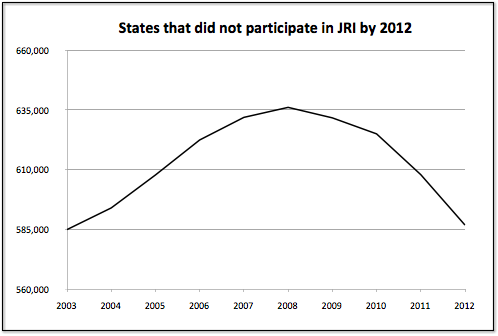 Counting these states among the non-JRI group further complicates comparison of JRI vs. non-JRI states. California, for instance, picked up the Performance Incentive Funding (PIF) concept from 2008 JRI work in Arizona and fashioned it with very light assistance from PSPP into SB 678 of 2009. In its first year of implementation, the California PIF program cut the number of probation revocations to state prison by nearly 6,200, a nearly the identical number by which the state’s prison population dropped from 2009 to 2010.” PSPP. Memo regarding comparing prison population trends across states, pg. 2. The following states are included in this graph: Delaware, Georgia, Hawaii, Missouri, Oklahoma, Alabama, Arkansas, Kentucky, Louisiana, North Carolina, Ohio, Michigan, New Hampshire, South Carolina, Illinois, Wisconsin, Arizona, Connecticut, Pennsylvania, Rhode Island, Vermont, Kansas, Nevada, Texas. 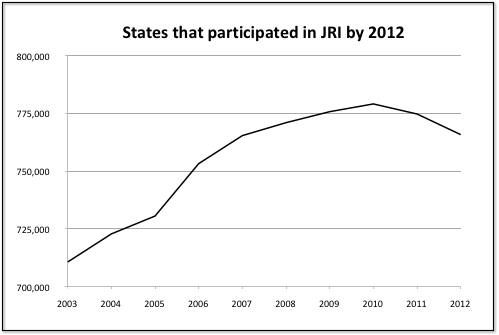 This graph combines data from states that participated in JRI in various years. Therefore growth in states that received assistance in more recent years may offset the reductions in growth in states that received assistance in earlier years. This affects the shape of the curve and interpretation of the impact of the reforms. The following states are included in this graph: Oregon, South Dakota, West Virginia, Alaska, California, Colorado, Florida, Idaho, Indiana, Iowa, Maine, Maryland, Massachusetts, Minnesota, Mississippi, Montana, Nebraska, New Jersey, New Mexico, New York, North Dakota, Tennessee, Utah, Virginia, Washington, Wyoming. Three of the states – Oregon, South Dakota, and West Virginia – participated in JRI in 2013. We would not expect the effects to be visible in this graph. The graph of “states Pew worked in by 2012” plots the sum of the prison population in all such states. 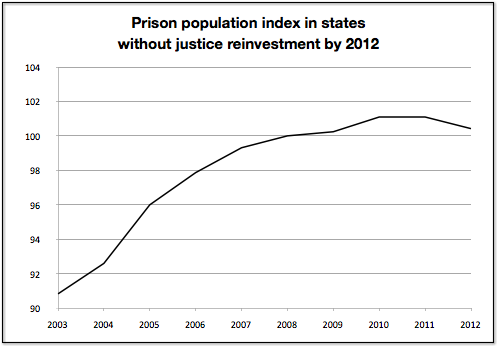 The graph of “states Pew did not work in” plots the sum of the prison population in all other states. 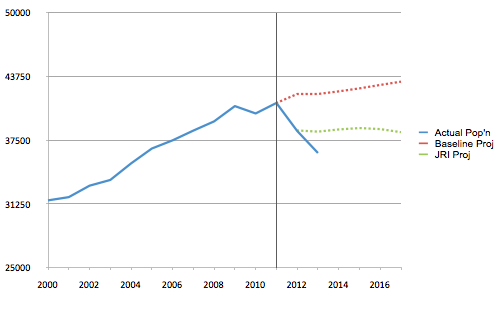 PSPP suggested to us that the disruption in the trend of prison growth in states in which they did not operate may largely be explained by idiosyncratic policy changes in two large states – New York and California – and therefore may not suggest that prison growth would have stopped in other states without PSPP’s intervention. Additional graphs exploring this hypothesis can be found here. While New York and California do account for a large portion of the decline in prison populations in states where PSPP did not work, prison growth in those states stagnated even when New York and California are excluded. For the two graphs of indices, we first created an index of the prison population in each state, which was set to 100 in 2008. Details of this calculation can be seen in our spreadsheet posted here. 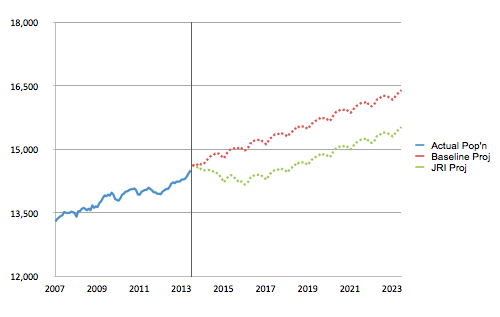 The “comprehensive reform index” graph plots the mean index in each year among states that PSPP categorized as achieving “comprehensive reform” by 2012. 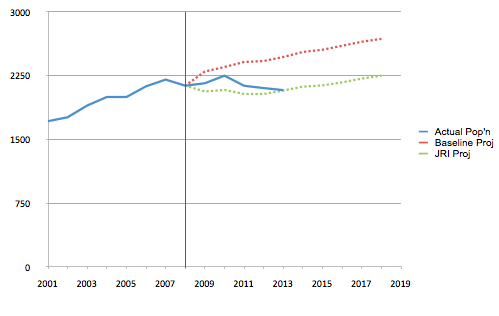 The “non-Pew index” graph plots the mean index in each year among states that PSPP did not work in by 2012. 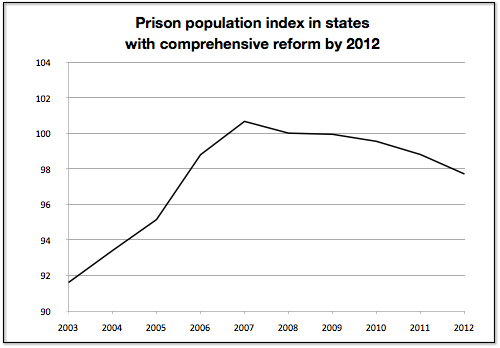 The two “index” graphs are a measure of changes in prison populations that are not weighted by the size of each state. The following states are included in this graph: Georgia, Hawaii, Oklahoma, Arkansas, Kentucky, North Carolina, Ohio, Michigan, New Hampshire, South Carolina, Wisconsin, Connecticut, Pennsylvania, Rhode Island, Vermont, Kansas, Nevada, Texas. The following states are included in this graph: Oregon, South Dakota, West Virginia, Alaska, California, Colorado, Florida, Idaho, Indiana, Iowa, Maine, Maryland, Massachusetts, Minnesota, Mississippi, Montana, Nebraska, New Jersey, New Mexico, New York, North Dakota, Tennessee, Utah, Virginia, Washington, Wyoming, Delaware, Missouri, Alabama, Louisiana, Illinois, Arizona. We plan to have at least one more conversation, seeking out the point of view of someone who believes that incarceration rates should be lower but has opposed the justice reinvestment process. PSPP comments on draft of this report. 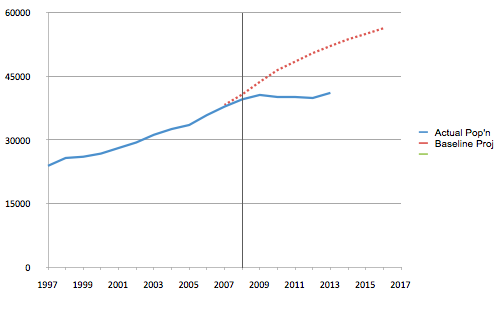 (85,800 fewer prisoners at any point in time)*(10 year impact of reform)*(100% credit to PSPP) = 858,000. “[T]he partners are ramping up the more rigorous policy evaluations necessary to gain a deeper understanding of whether and why specific reforms succeeded or failed. These evaluations will include quantitative analyses of data and qualitative components that assess implementation and help provide valuable context.” PSPP. Memo regarding comparing prison population trends across states, pg. 1. Some policies supported by PSPP that we would guess would reduce incarceration without a substantial adverse impact on crime rates include: “Risk and needs assessments, implemented in 16 JRI states, help predict a person’s risk to reoffend through the identification of criminal risk factors. These assessments inform decisions about detention, incarceration, and release conditions as well as the allocation of supervision and treatment resources… . Earned credits include both good time and earned time credits. These credits provide sentence reductions for inmates who maintain good behavior or participate in prison programs. Earned credits were adopted by 15 JRI states. Intermediate and graduated sanctions establish swift and certain responses, such as short jail stays, for parole and probation technical violators. These sanctions are alternatives to reincarceration. The HOPE (Hawaii Opportunity Probation with Enforcement) model for probationers, which couples swift and certain punishment with drug testing, is being piloted in three JRI states. Some states have developed response matrices that include both punitive and incentive-based responses designed to promote offender accountability and positive behavior change. Fifteen JRI states adopted intermediate and graduated sanctions. Community-based treatment programs were developed or expanded in 11 JRI states. States expanded the availability of programming and services by increasing funding for key services such as substance abuse treatment, and many encourage the use of these programs by requiring that reentry plans be developed for exiting prisoners… . Mandatory supervision requirements ensure that certain exiting prisoners receive post-release supervision. States may use risk assessments to target serious offenders or those at high risk of reoffending for supervision. This type of policy change was adopted by seven states.” LaVigne et al 2014, pg. 2. PSPP informed us that they track the accuracy of some, but not all, of their intermediate-level predictions during our Jake Horowitz and Brian Elderbroom conversation on January 10, 2014. For example, “One section of Georgia’s 2012 reform package aimed to relieve local jail overcrowding by reducing delays in transfer of “state-responsible” inmates to the Department of Corrections. Jail backlogs were created by waiting lists for entry into probation detention centers and residential substance abuse centers. Georgia’s reform legislation sought to address this through electronic transfer of offender files, expansion of community-based treatment and program options, sentence-length caps at the detention centers, and expanded sentencing options for judges. Results: Prior to reform, about 1,700 state-responsible inmates were being held locally at a cost of tens of millions of dollars per year. By October 2013, the backlog was reduced to 610. Less than a year after adoption, the legislation virtually eliminated the wait list for probation detention centers.” Adam Gelb, PSPP Director, email to GiveWell on January 17, 2014. This is not entirely dissimilar from AMF’s decision not to release the names of countries with which it is in the “information stage” or “detailed discussion stage” of negotiating a net distribution or GiveDirectly’s request that we allow them some flexibility in choosing a time to release the fact that they had chosen Uganda as their second country. However, we expect similar situations to occur much more frequently with respect to organizations attempting to influence public policy.